After what has been a crazy, almost three years of self-employed life working in fashion, its seems the strains of holding that smile and yes attitude have finally caught up with me. So, I did it, two weeks off, no emails, (ok yes to emails), but no meetings! And this was all thanks to my new collaboration with Babylonstoren. From the start of 2018, I was lucky enough to be back to back with work proposals, shoots, breakfast and lunches, events, I mean for someone who’s self-employed and working in fashion, its an absolute dream. And well, it was. I flew to LA, Lake Como, Ibiza, Croatia, Mykonos, Copenhagen, Paris, all in two/three months, returning home in-between to wave to my boyfriend and swap suitcases. Hard work gets you here, and I’m super proud of where I’ve got to so far, happy where I sit, and hungry for more, but the whole ‘always being on’ switch was draining me dry. When people ask me what days I work, the answer is everyday, all day, from the moment I wake till finally falling asleep with my phone in my hand. I’m constantly working, shooting, emailing, editing, posting. This job is about visibility, although I’m a fashion stylist, and style is what I’m pushing, there’s a huge demand to also show yourself, and your life. That mixed with having to always be bright, positive and friendly when in meetings or on trips, it’s just, well, tiring being nice all the time! I should probably state how I know how incredibly lucky I am to be doing what I love, my jobs amazing, and I’m glad that I managed to see a gap in the market and jumped at what was at that time an uncertain career, but just like every single job, they get tiring, and we all need a break to reconnect with ourselves. A moment to be brought back down to earth and to the real basics of what you find important. So this is what I did, after retuning from my last trip (truly exhausted and scared to say that to anyone who doesn’t have the same profession) I canceled all my meetings for the next two weeks. It’s something I had never done before, although I was still replying on email and making sure deadlines were being met, I mean if I don’t, I frankly just don’t get paid, but it felt so freeing to say that I was going to take these two weeks to do as much as what I really wanted to do and not because I needed to. 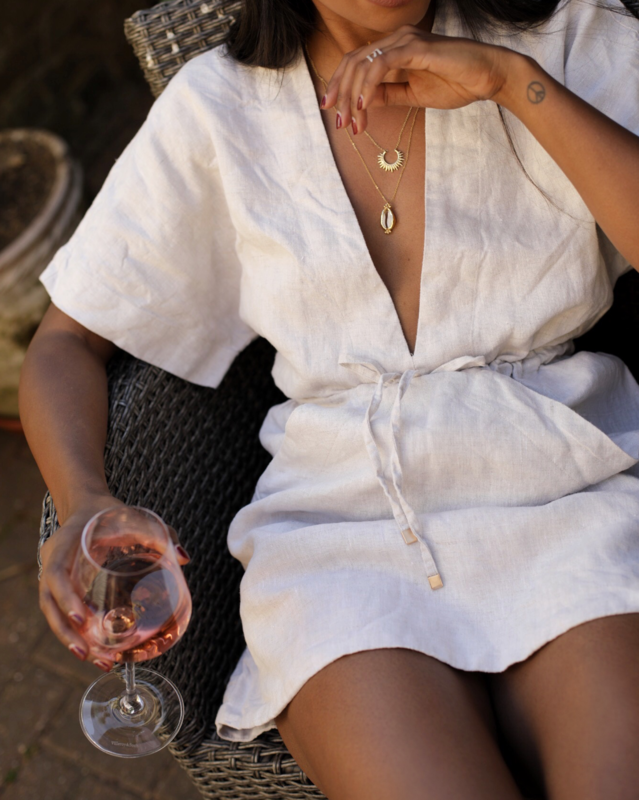 So with the help of the wine gods at Babylonstoren, I was able to take two weeks ‘off’, to focus on my life and enjoy doing what truly makes me happy. For the past year I have been a huge fan of working out, something I never thought I would but honestly I think its insanely important, not just for my body but also my mental health. Boxing, cardio, running, long walks, something each day where I can be free and completely destress. We all do it way too often, the slip of the tongue on a sudden face to face collide or a completely deluded social media stalking moment; ‘Oh I cant believe it’s been so long! We must meet!’ Followed by the sheer panic of having to make up an excuse to cancel when that coffee time comes. I’ve always wondered why this happens, why I do this to myself, and I think its because I want to be kind, I have met some incredible people in my life and I love them in individual ways, but sometimes friendships move on, and people grow apart. I think now being 29, I’ve realised I’m ok with that, and I’m happy to invest my precious free time (all of our free time is precious!) on people who are in my lives, who I love, trust, and who give back what I put in. I love my friends, I’m lucky enough to have my friends from back home home and my London girls who I’ve met through work, and from having a Welsh boyfriend who moved to London with all his pals and their amazing wives. These people are the ones who I invested my time in, to reconnect with them, giving them my undying attention without panicking about being late for my next meeting. Friendship is rare and I’m lucky to have these ladies so it was about time I showed them. Enter the fun one, wine!!!! With the sun shining this was a no brainer, plus with two of my friends currently on their own sabbaticals from work, we didn’t have to worry about that hangover the next day. 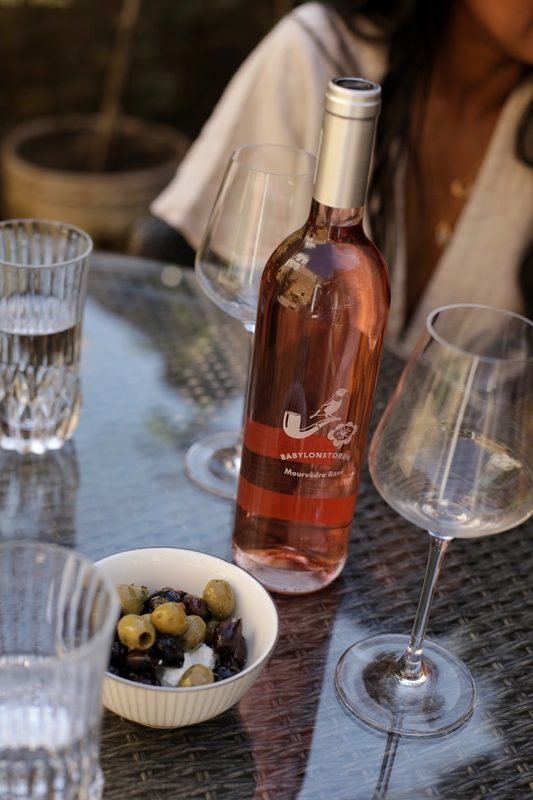 Thankfully, Mourvèdre Rosé was the flavour of the two weeks, a light salmon pink wine by Babylonstoren, which leaves the taste of strawberry yoghurt on the palate with a candy-floss finish. 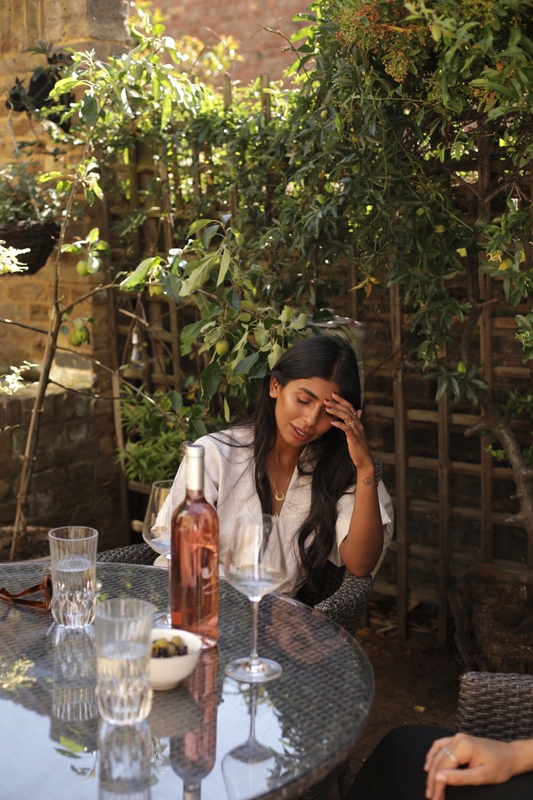 Dry and unwooded, this rosé is produced in South Africa, somewhere my boyfriend and I are planning on visiting in the colder UK months. They have a stunning Farm Hotel where you can enjoy an afternoon of wine tasting, something I’ve never done and is one on my list of things to do. 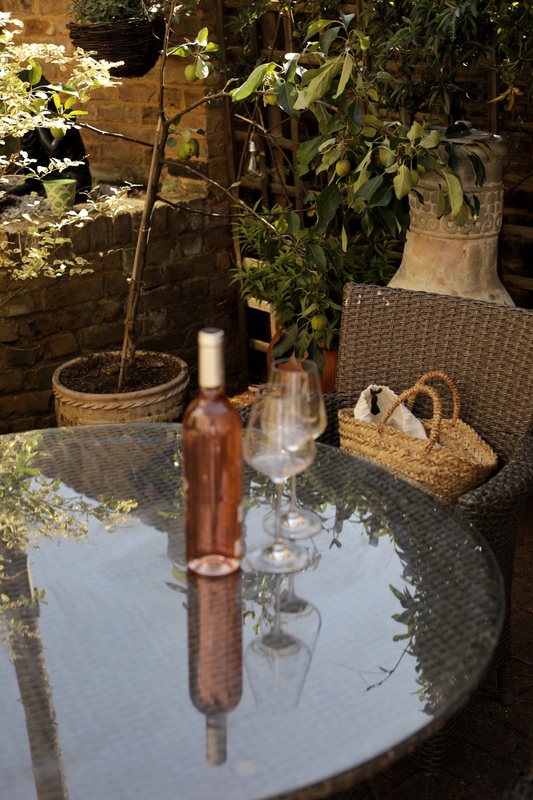 But for now they deliver the wine and it’s essence of raspberries and rose petals free of charge to the UK, so we could enjoy a glass of their Vintage 2018 in the comfort of our friends intimate garden by Northcote Road. 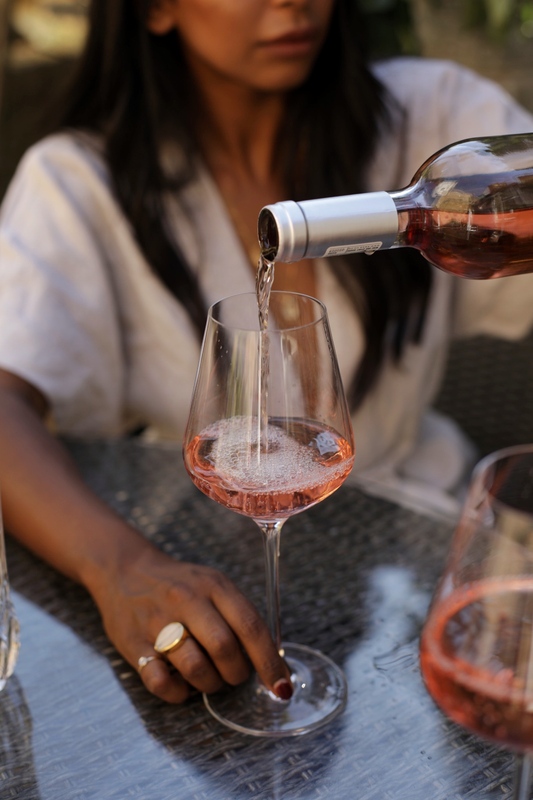 Wine brings the excuse to relax and enjoy conversation minus the distracting noise of phones going off. Social media was put on hold while we explored the ins and outs of each others lives, something that can be lost in todays fast paced era. These two weeks have been completely opened my eyes to how quickly my life is moving, yes it’s going in a very exciting direction, but it’s so important to take those moments away from work, social media, expectations, so you can get back to the core of what your soul needs and deserves. I value time with my friends and family as well as my own ‘me’ time and it’s crucial to create those moments. I love my flat. I love my me time and time with my boyfriend. But with all the chaos of traveling from place to place, our one bedroom flat had been totally destroyed with a mountains of clothes throughout, clean and dirty. So this was my chance to Spring clean, sort everything out and make it the zen place it once was. Our home is our safe place, so its important to treat it with respect. Plus, seeing the smile on his face when walking in from a hard days work totally melted me.